A third of oil reserves, half of gas reserves and over 80% of current coal reserves globally should remain in the ground and not be used before 2050 if global warming is to stay below the 2 C target agreed by policy makers, according to new research by the UCL Institute for Sustainable Resources. The study funded by the UK Energy Research Centre and published in Nature today, also identifies the geographic location of existing reserves that should remain unused and so sets out the regions that stand to lose most from achieving the 2 C goal. "Policy makers must realise that their instincts to completely use the fossil fuels within their countries are wholly incompatible with their commitments to the 2 C goal. If they go ahead with developing their own resources, they must be asked which reserves elsewhere should remain unburnt in order for the carbon budget not to be exceeded." Co-author Professor Paul Ekins, Professor of Resources and Environmental Policy at and Director of the UCL Institute for Sustainable Resources, who received an OBE for services to environmental policy in the 2015 New Year's Honours list, said: "Companies spent over $670 billion (£430 billion) last year searching for and developing new fossil fuel resources. They will need to rethink such substantial budgets if policies are implemented to support the 2oC limit, especially as new discoveries cannot lead to increased aggregate production. Now we are getting to the root of the problem, and the real reason the Koch brothers are spending huge sums to fight the science. The root problem is some people magnify perceived (and often imaginary) problems disproportionately to actual risk. There is little evidence that CO2 from fossil fuel burning is significantly warming the planet. 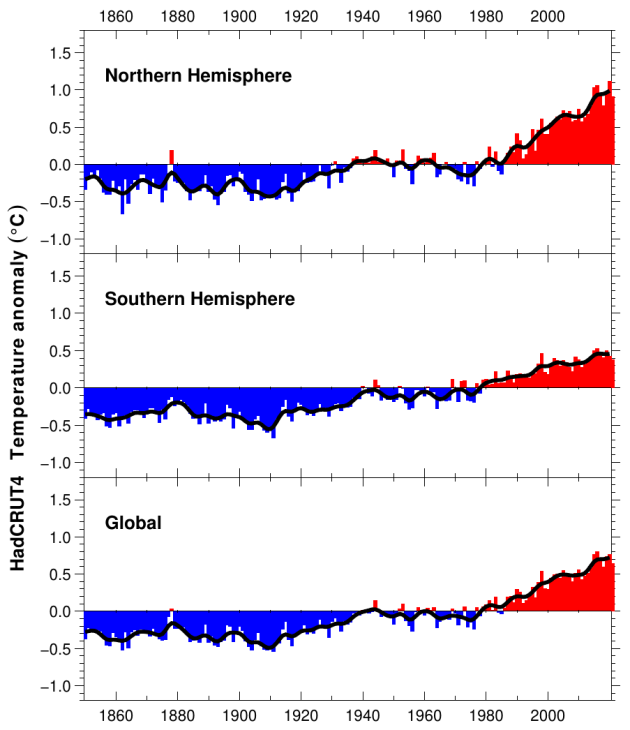 Global temperatures don't track very well with CO2 levels currently or historically. Notice no warming even though CO2 has increased ~35 ppm over the last 17 years. The earth warmed about 0.8 C between 1880 and 2014. If the same trend continues it will take 200 years to warm another 1.2 C to reach the 2 C limit proposed. Even if governments don't arbitrarily restrict CO2 emissions, what is likely to happen in the next 2 centuries that will reduce them? -World population will peak and perhaps decline in the next 30 to 50 years. -Wealth and living standards in developing countries will improve enough that reducing emissions will become affordable and practical. -Technology will improve and energy use will become more efficient, decreasing CO2 emissions. -Technological progress also means new forms of practical and "clean" energy will likely be developed. For example, U.S. CO2 and methane emissions have declined recently largely due to fracking technology creating a natural gas boom. Will fusion be viable in 200 years? Can i ask mr askdad if he is aware of the role of oceans in the thermodynamic balance on this planet? If not then is he proposing that the world's experts are ignorant of it as well? FYI there are rather more complex sinks/sources available to the atmosphere than simply the Sun (directly) and the back-radiated LW from GHG's. I suggest you study the mass of the oceans, the heat content of them relative to that of the atmosphere, and consider the fact that land also massively cools in winter. Oh BTW why not earn yourself a Nobel and prove CO2 does not do what it does .... as has been know of for ~150 years. Empirical science my friend and NOT up for discussion. Models are not the science they attempt to attribute the internal distribution of heat on this planet trapped by anthro CO2, and cannot forecast the ENSO/PDO cycle. Those that have (acccidentally - 2 Canadian models) have it spot on. None of these posts tell us which ones we should leave. It will be the last ones we get to, probably. But if we were intelligent, we would use that fuel with the least carbon. This is an important concept: We simply cannot burn all that fuel without serious consequences before we get to it all. All the new "findings" could be left undisturbed for decades until better ways are found to use it. BTW, I do not expect coal to go away, there are too many uses for it. Some biological systems have been shown to work, which may be a great idea. We can produce energy without the pollution. The earth warmed about 0.8 C between 1880 and 2014. Wow - wonder where aksdad learned to read a graph. Depending on which specific data set you pick from aksdad's link - you can see that temps have actually risen about .7, or .8 degrees in the past 45 years (approx). This would certainly change the honesty of your post - right aksdad? Oh, so now it's about the last 45 years? What happened to 150 years? aksdad, it is odd that you continue to link to sites that, when read, actually support the contention of ongoing human caused global warming and then post as if they somehow say something different. It is almost as though you simply pick a site that has some key words you like, and then link it without actually taking the time to read what is being said. Ubamoron is the queen of this behavior, and I am frankly disappointed that you would stoop to such tactics. 0.8C warming over the last 150 years or so is actually a big deal - especially when you consider that the bulk of that 0.8C occurred in the last 50 or so years. It is also clear from looking at the very graphs you provide that the pace of the warming is picking up - suggesting that a 2C rise or more will occur much sooner than 200 years. Do you understand that the warming is not linear? And now, 2014 has been logged as the hottest year ever recorded. What don't you understand about this? This is an excellent article and I read another article on this same subject in another forum. Basically it says to maintain only a 2C rise in temperature by 2100 that ~60% of all fossil fuel resources have to stay in the ground by 2050. That is coal, oil, natural gas, and others. Indeed the report is very accurate and true in it's analysis. The question is whether it is possible to action to happen that brings about this reduction. To me this a no-brainer. If an asteroid was going to strike the earth 85 years out, would you do everything to build and implement a defense? If that mean reducing all fossil fuel consumption, you would be forced to. So what is the difference between that and global warming? As @Maggnus points out 2014 has been logged as the hottest year ever recorded. Just like a predicted asteroid strike, this needs to be addressed with concern and immediacy. Why do you insist on commenting - when all you do is show your inability to understand the issues? aksdad referenced a series of graphs that show temperatures since 1850. Here is an example http://www.cru.ue...RUT4.png Now - to take that entire graph - and say there is a total temperature increase of about .8 degrees - over a 165 year period - so to predict the future - we should use .8 degrees over 165 years as the slope - would be totally ignorant. The obvious fact (if you are able to look at and understand a graph) is that there is a very clear acceleration of the warming - starting at about 1910, a flat spot from 1940 to 1980, and then back to the accelerated warming of about .7 degrees - over about 45 years. aksdad is being very dishonest in saying we should use .8 degrees over 150 years as the predictor of future warming. Why do you have to be such a liar? It was you insisting on 150 year trends recently. Admit it. Polluting for profit is a short-term proposition. .... CO2 has increased ~35 ppm over the last 17 years. Seems that this is a violation of property rights. People who purchase a product are responsible for that product regardless of it's form. Dumping the waste, after a product is used, onto another persons property is considered a crime. Either carbon capture or finical reimbursement should be practiced. Another lie. The graph is about the temperature, period. What would be a good prediction as to the future rate of warming? (see - a different question). Well - as the warming has clearly accelerated over the past 50 years (look at the graphs) - it would make sense to go with the more recent accelerated slope. As it has stopped the last 18 years, and even cooled the past dozen or so, your "more recent accelerated slope" is hogwash. Nobody has yet answered the question of what we choose to leave unburned. 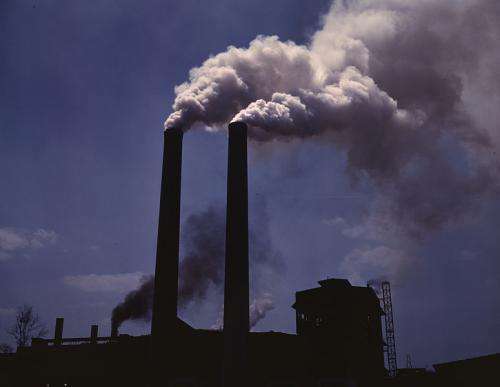 Let's see how much we can leave for our kids and grandkids, instead of leaving them pollution! They will need them as feedstocks. I think if a broken clock was correct once, and twice, you can be damn certain it will be correct again. Our CO2 problem is already sequestered in the ground. We just need to keep it that way!